Malnutrition in Africa: Oh, the Irony! It is 8:00 a.m. and I am already at the Agrobiodiversity and Nutrition diversity poster session. Today, I am doubling as a student reporter and a poster presenter. The room is filled with enthusiastic faces, hungry for information on the topic. The session started on high note with a presentation on potato farming in Peru. However, something caught my eye throughout the presentations. All the other topics, including mine were about Africa. One of the speakers swept me away with his research on biofortification of cassava. This is good news! However, allow me to talk about the other side of the story. 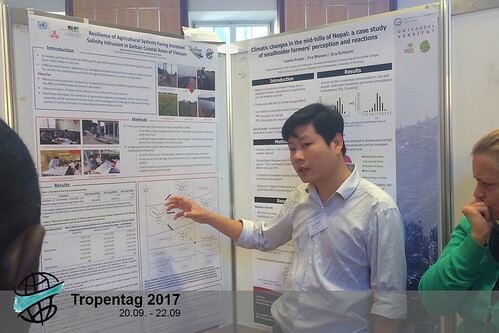 Starting very early in the morning of the second day of Tropentag 2017, the poster sessions on Risk and Awareness still attracted many people. It is good news that this year many presented research focused on understanding the farmers’ perception through different approaches. It also made the session more interesting with lots of discussions. While Akary Min investigated how farmers adapt to climate change in the Central Dry Zone of Myanmar, Amie Heri-Kazi Bisimwa from Eastern of DR Congo was more inclined towards the farmers’ perceptions of land degradation in South Kivu. And Minh Tu Nguyen has been currently working on the subjective measurement of resilience of agricultural systems to increased salinity intrusion in Vietnam. More surprisingly, Emily Mutota tried to apply a new method, ‘’photovoice’’, in which she attempted to understand the perception of the local community about their own habitats by asking them to expressing it through the photos they captured. Even though, personally, I was not able to find many promising results from this research, her attempts with a new approach should be appreciated. "Nutrition & Food Security are Our Topics"
I talked to Mr Siegfried Harrer of the Federal Office for Agriculture and Food (BLE) – an office that is subordinate to the Federal Ministry of Food and Agriculture (BMEL) with German Federal Minister for Food and Agriculture Schmidt. 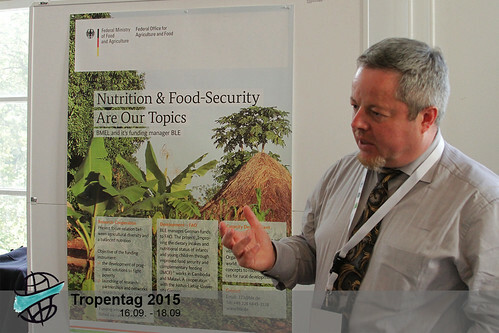 BMEL is one of the donors of Tropentag 2015. Harrer said that BMEL is spending 8.5 million Euros on 8 different science projects this year. 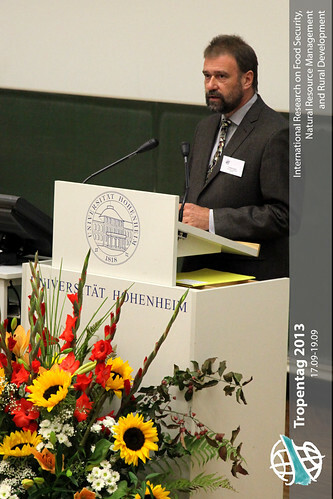 The main interest of BLE being at Tropentag is to get in contact with other organizations and researchers. They organize workshops for local farmers around the world. Furthermore they have upcoming possibilities for young scientists from developing countries to get grants. Voices from around the world fill the entrance hall of the Study and Information Center this morning, as Tropentag Conference participants line up for registration. The energy level is high, and colleagues greet each other with smiles and handshakes, many with poster tubes over their shoulders, ready to present their research in the coming days. But whom exactly might you find on the campus of the Czech University of Life Sciences in Prague this morning? "The Silver Bullet" for the "The Cinderella Sector"
Food Safety- Breakout session “More than one billion of the world population are hungry and more than two billion are sickened each year from the food they ate. Agriculture is exacting a heavy biological cost, but health policy and programs often stop at the clinic door.” Food safety has for a longtime been ignored in the talks regarding food security, despite food borne diseases being considered the number one killer in the world. This has further been compromised as food security has been stretched based on the high demands. Furthermore, over the years little investments have been directed to this area. Delia Grace, International Livestock Research Institute (ILRI) The suggested way to addressing food safety being from farm to folk, which includes the long chain from production to consumption, this includes; from harvesting, to the informal markets, to the storage, as well as areas of waste. Mycotoxins, which are very toxic fungus found in major crops and have been reported to contaminate over 25% of the world produce, are of great interest to researchers. 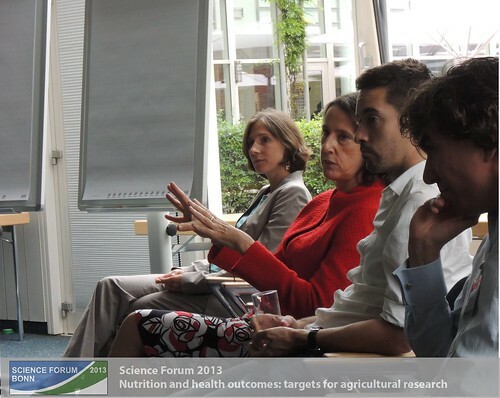 "Agricultural research and nutrition go hand in hand with regards to food security." 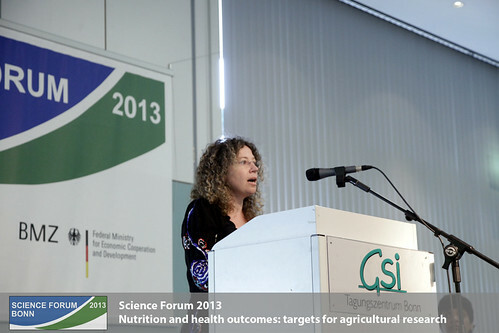 This was the opening remark for the Science Forum 2013. With that, key factors in research regarding major crops like maize and rice, and the requirement of genetic research, need to be put in place. The innovative transfers of research findings is very essential especially to the farm levels; through networking and partnership, exchange is promoted among international agricultural centres, institutes and scientists. 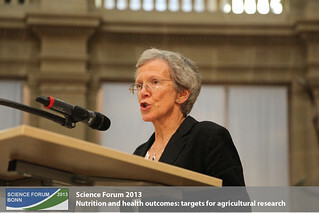 Maggie Gill, ISPC Council Member and Science Forum 2013 Chair Funding bodies allocate funds for agricultural research institution in partner countries, with the role for its member organizations being to support European agricultural research and development to promote knowledge transfers. This would contribute to success of international agriculture research for development. System level-objectives of these funding bodies include reformation which focuses on reducing rural poverty, improving food security in terms of quantity, quality and affordability, improving nutrition and health, and a sustainable management of environment and natural resources. "Agricultural development within the rural-urban continuum” By Prof. Dr. F. Asch; for Organizing committee, Prof. Dr. S. Dabbert, President, University of Hohenheim ”According to projections of the UN, 70% of the global population will be living in urban areas by 2050” ”on this basis, Prof. Dr. F. Asch, officiated and welcomed the over 800 participants, and at the same time thanked the main sponsors of Tropentag conference.